LAS VEGAS, June 5, 2018 /PRNewswire/ -- Peerless-AV®, an award-winning designer and manufacturer of the highest quality audio and video solutions and accessories, is excited to introduce its new Xtreme™ High Bright Outdoor Display. Exhibiting in Booth C2947 from June 6 through June 8, the company will showcase its new outdoor display alongside its latest innovations in AV at the Las Vegas Convention Center during InfoComm 2018. Featuring a patented Dynamic Thermal Transfer™ system that allows the display to operate in extreme temperatures ranging from -31°F to 140°F, the Xtreme™ High Bright Outdoor Display is ideal for any digital signage application, including sporting venues, theme parks, transportation, retail, education, hospitality, and more. With the highest environmental rating in its class and a high TNI panel, the Xtreme™ High Bright Outdoor Display thrives in all applications, especially in direct sunlight, without compromising the life of the panel or its color accuracy. "We are excited to expand our line of Xtreme™ outdoor displays to include a solution with advanced features, like increased brightness and remote monitoring functionality, that end-users are looking for," said Todd Mares, Director of Emerging Technologies, Peerless-AV. "With the Xtreme™ High Bright Outdoor Display, our customers are able to create compelling messages in a bright atmosphere while having the capabilities to tunnel through an IP address and monitor their displays' health and wellness, viewing data in real time." 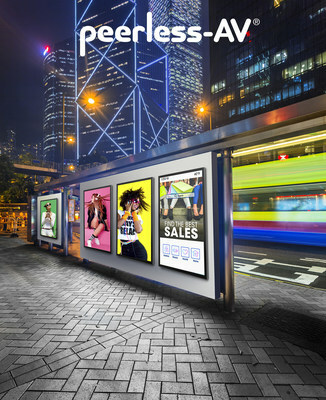 Peerless-AV's Xtreme™ High Bright Outdoor Displays will be available in June 2018 through Peerless-AV direct sales representatives and authorized distribution networks. For more product details, please visit: www.peerless-av.com/XtremeHB.